Arrive in Zhangjiajie today. Upon arrival, you are met and transferred to your hotel. 9:00 am, take a cable car up to the scenic Yellow Stone Village to have a 2-hour hike. Afternoon, enjoy a 2.5-hour leisure walking along the Golden Whip Stream, where is most likely to bring you into the Pandora's wonderland of the movie Avatar. Another full day to explore the Zhangjiajie National Forest Park, we will ascend the Yuanjiajie Mountain by the Bailong Elevator - a glass elevator built into the side of the mountain. On the summit, you will take about 2.5 hours to discover the famous "Hallelujah Mountains", the Platform of Forgetfulness, the No. 1 Bridge under Heaven, and some other beautiful sights. Afternoon, transfer to see the Tianzi Mountain. Then take a cable car down the mountain and go on sightseeing along the dreamlike Fairyland – Ten-mile Natural Gallery (mini-train is optional). Following breakfast, drive about 3 hours to explore a natural wonder in Guzhang county - the Red Stone Forest National Geopark. Continue to Fenghuang Ancient Town, a Miao people's town of western Hunan. Your local tour will take you to former residences of celebrities, temples, museums, stilted buildings, old streets, and a short boating in the Tuo River, etc. Fenghuang Ancient Town was added to the UNESCO World Heritage Tentative List on March 28, 2008 in the cultural category. This ancient town was regarded as the most beautiful town in China by New Zealand writer Rewi Alley. It was built in 1704, and has 300 years of history. The ancient city is a gathering place for Miao and Tujia ethnic minority. It has an exceptionally well-preserved ancient town that harbors unique ethnic languages, customs, arts as well as many distinctive architectural remains of Ming and Qing styles. Enjoy a leisurely morning where you are free to explore the ancient town of Fenghuang. This afternoon drive back to Zhangjiajie city. Activities for today: Tianmen Mountain National Forest Park, airport transfer. 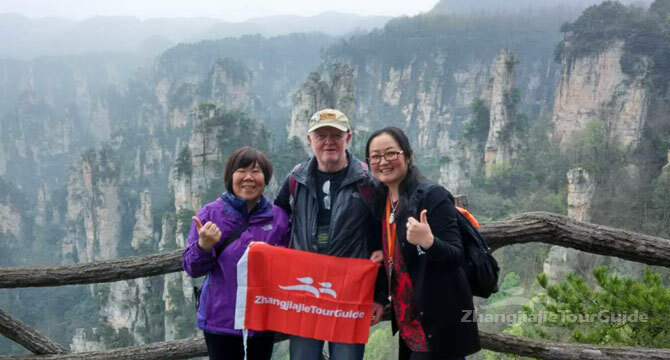 8:30 am, drive to explore the Tianmen Mountain National Forest Park, the symbol and soul of Zhangjiajie. We will experience a ride on the world's longest cable car up to the summit of the Tianmen Mountain, taking in the spectacular scenery as you do so. In the mountain, you will walk (approximately 2 hours) along the plank road in the cliffs. During the hiking, you can choose to experience the glass skywalk built along a cliff with an extra expense (RMB5/pp). After the hiking, you will pay a visit to the Tiammen Temple and some other famous scenic spots, then take the Forest Sightseeing cable car and back to the Tianmen Mountain cable car station and take the big cable car up to the middle station. Take a bus along the Heaven-linking Avenue (a famous mountain-winding highway in the world) to explore the Tianmen Cave. Afterwards, you'll be transferred to Zhangjiajie Hehua Airport, where your trip comes to an end and you're free to make your way onwards.